There is talk of a new DNA sequencing device that is stopping scientists in their tracks. Up until now, medical science has had to work hard and pay dearly to read small fragments of DNA, and it has been a slow process at that. Among the innovations at the small UK firm, Oxford Nanopore, is a DNA sequencer in the form of a USB thumb drive. It has the promise and potential to revolutionize how DNA is read. 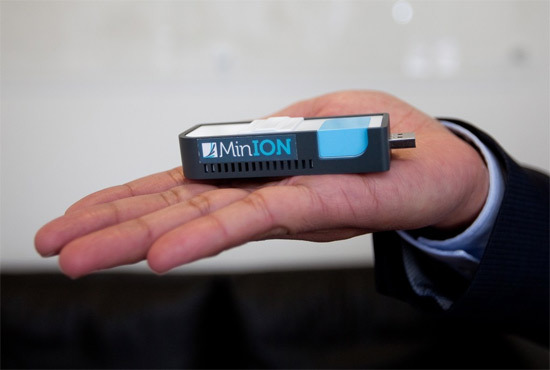 While a MINion USB stick could not sequence an entire human genome, it is projected to be able to sequence simple genomes such as bacteria and viruses in seconds. It could alter the way that medical treatment is delivered forever if it actually lives up to its developers’ claims. Within a fraction of the time and cost that it would take now, any physician with a MINion USB drive could potentially get far faster answers for patients waiting on test results like blood and biopsy. The cost for facilities is only about $900 per drive. The process by which the USB DNA sequencer works is quite complicated, but it has two distinct advantages over current sequencing devices. It can read much longer DNA strands. Right now, technology must shear the DNA into small pieces that are no more than a few hundred bases each; that’s compared to the MINion’s capability to read a strand as long as 10,000 bases without stopping thanks to a bio-mechanical sieve. Additionally, the process is much quicker because it does not need to deal with the lengthy amplification process. However, everyone is certainly not sold on this project. Competitor Jonathan Rothberg has not let his doubt in the accuracy and abilities of this device go unheard. These questions include the feasibility of manufacturing parts within a year’s time. He is not only an entrepreneur and founder of 454 Life Sciences, but is also a scientist himself. He is also one of Oxford Nanopore’s biggest critics. It is difficult to say whether his contempt is well-founded or if he simply has his feathers ruffled because Ion Torrent (his new startup company) is also working on the development of a desktop DNA sequencer, dubbed the Proton. Certainly, this is a controversial topic because there have been flukes before (like the Pacific Bioscience of California’s efforts). While there are still many questions to be answered, the MINion has certainly made a huge impression on the scientific community. Just envision what could be learned, how many people could be helped and how much further scientific research could be taken if this little DNA thumb drive is the real deal! Let us know what you think of this USB device below. This entry was posted in Articles, USB Devices, USB Gadgets, USB Stick and tagged DNA sequencer, DNA sequencing device, How a USB Drive Could Sequence DNA, MinION DNA Sequencer, MINion USB DNA Sequencer, MinION USB miniature DNA sequencer, MINion USB stick, USB DNA sequencer. Bookmark the permalink.